Looking North by Northwest from Bell's Cross on top of the Big Hill. As can be seen, there isn't much color this time of year. Temps started in the low-50's, ended in the mid-60's. Sunny with strong and steady, westerly winds of 20+ mph. Fairly easy hike along easy to see and traverse dry trails with little to no, vegetation covering them. With the strong winds, most of the birds either stayed low to the ground or, conversely, high in the sky riding the currents. Numerous small birds stayed in the scrub so photos were nearly impossible. On the other hand, I saw a couple of raptors and vultures high in the sky, riding the wind currents as they looked for food. 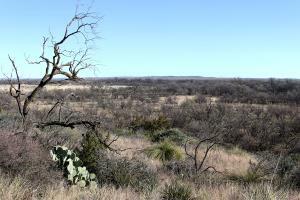 Most of the leaves have fallen so the landscape is colorless, except for the cacti, junipers and a few live oaks. Water is available at the campground area by Bell's Trailhead.